12 Text Only Browsers: – Did you ever find yourself in a situation when you are browsing something important or saving some data and the slow internet speed kills it all? Well, we all go through such situations every now and then, and we are left midway wondering what to do next! At this point, what we need is a Text Only Browser that can help us browse only in text mode minus the graphics. The interfaces of these browsers are extremely simple in layout and function quite speedily. When you open some of the text based browsers you will find options to browse through different websites, and for some you will need to use shortcut keys to navigate. But wait, the benefits of these browsers don’t stop here as these browsers are occasionally used by programmers as well. Experience uncomplicated browsing and reading without the graphics, identify the viewing habits of web crawlers and track the ease of your web pages using Text Only Browsers. So, let’s take you to the world of some of the best Text Only Browsers that are free and some are even open source. Lynx easily leads the text based browser category as it is the oldest text based browser and highly susceptible to configuration. It is a complete browser and not an extension as you must have thought. What’s good here is that even though it is the forbearer of the Text Only Browser category it works with most of the operating systems like Windows, Unix, etc. and even with their latest versions. The text interface of Lynx resembles more of a command line that makes it extremely easy to navigate. When you run this text-only-browser it takes you directly to their homepage. Press the “G” key, input the desired website URL and hit the “Enter” button to open up a new website. Use the four arrow keys on your keyboard to navigate through the webpage. You can also see the instructions on the shortcut keys mentioned at the bottom of the screen. You can also use the web version of Lynx) which is totally different from the text version), however, it allows you to view only verified websites and not just any web page. WebIE is a text based browser that is available to download for your Windows OS free of cost and that gives you access to websites in text form only. While it is specially designed for the visually impaired or who those have no vision completely, it can also be used by everyone in case they do not want to run a graphical website. In order to begin text browsing, you simply need to enter the URL and there you go! Since the browser is completely based on text you will not be able to click open any hyperlinks. You can get access to the hyperlinks, by rather pressing “Ctrl+Enter” on the word that says “Link” placed before the hyperlink. The loaded website will not be in its original pattern. Apart from opening up a “Link”, there are several other shortcut keys which you can use navigate across WebIE. So for example, if you want to go to the Headline you can press Ctrl+H or to access the graphical version of the website you can press Ctrl+I. For more shortcuts refer to the “Help” option within the “Manual” button. Additionally, you can change the font options like the size or the color and assists you with several other features like arranging favorite web pages, activating or deactivating pop-ups, view RSS newsfeed and more. Save the web page in TXT or in HTML format, login to your email accounts, take a printout of the web page or seek help from the support team, WebIE does a lot more than the regular Text Only Browsers. 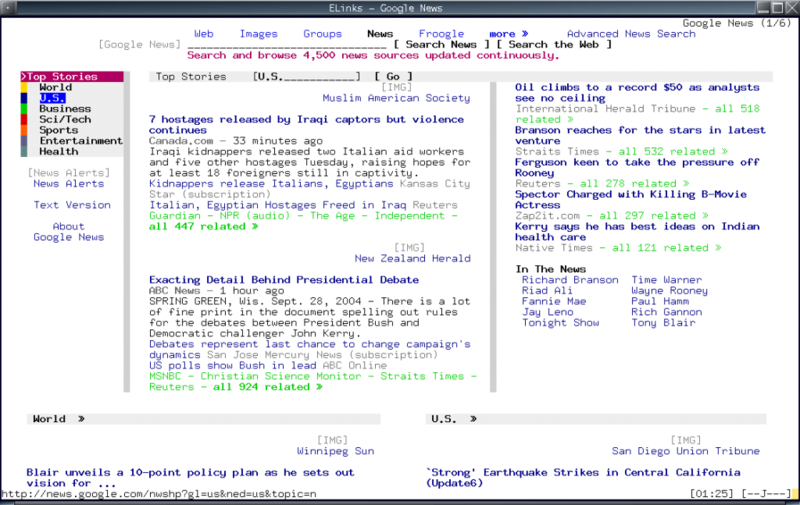 One of the open source text based browser suited for your Windows OS is Elinks that comes with an elementary interface that more resembles a Command Line. On opening Elink you will see a prompt that asks you to enter the URL. Simply type the website URL to open the web page, hit the OK button and then the Enter key to start browsing. The original pattern of the website is maintained on this text based browser, while white text appears on the black background. You can simply use the up and down arrow keys for navigation, and to open a hyperlink you can press the right arrow key. The left key, on the other hand, is used to go back to the last browsed page. Same as the WebIE, you can press the “G” key to open a dialog box where you can enter the website URL and browse the web page. There are many other shortcut keys which you can find on the Elink’s Documentation Webpage. To “Reload” a page, get the “Close Tab” buttons or access the “Bookmarks” you can right click on the graphical user interface of Elink. One of the easiest text only browsers, Elink is available to download for free. If you are looking for a trustworthy text based browser, you can definitely rely on Labnol Text Browser. It’s owned and designed by the person who also owns several other popular websites like, the beloved technology, design blog and digital inspiration. It runs effortlessly via Google Scripts and does not even take up a lot of resources. 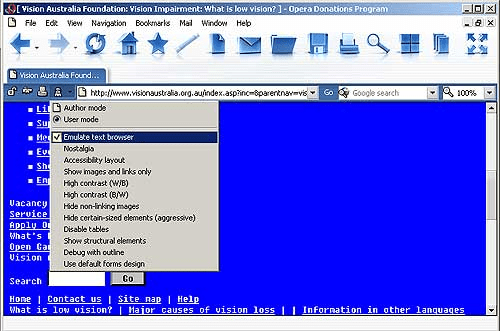 As soon as the web page opens in the Labnol Text Browser, the internal links also open automatically within the same browser. That’s not all, as you can also use this text only browser as a proxy server to read news articles and other internet content that’s based on text only. The hidden Google Apps Script runs the website you want to visit and gets the site on the Google’s servers which then further display the content on your computer screen. That means, even if the site does not have permission, you can still load it using the Google Cloud. You can also check if a specific website is really down or it’s the fault of your internet connection. This one falls in the extension category for text based browsers. Text Mode is an extension for text browsing on Google Chrome. By adding this extension you can convert Chrome into a text based browser that displays only the text on a website and no graphics. Even though it’s in the text form, it retains the primary pattern of the website. Along with images, the Text Mode also disables any videos or Flash content on the website. Since it’s an extension, it gets easier for you to switch between the normal mode and the text only mode by simply clicking on the extension icon placed on the toolbar. Further, if you right click on the “Options” button it gives you the choice to “desaturate” the website in case you want. The text only browser mode offers monochrome pages that are soothing to your eyes. It also decreases the load on the web pages and renders access to text mode in just one click of the mouse. One of the benefits that we love is its ability to remove most of the advertisements (99 percent) with no additional software required. Additionally, if you are in the mood to further customize, you can change the website background to white. Now, how do you recognize the images? They are supplemented with empty spaces, so in case that looks odd to you, you can replace them with a plane surface or background. Text-Only Mode is another Google Chrome extension that is not only available for free, but is also extremely simple to use. You need to add this just like any other extension on Google Chrome and you can now use this both on the Chrome browser as well as on Chromebook. With this text based browser, you can open and view websites in only text mode that contains no images, videos or flash. Once you have installed the extension, you may need to close Chrome and start again so that it works properly in the text only mode. The best part about this extension is that it retains the original color and the design while you browse in the text only mode. You can also open a link in Text-Only Mode sans any images or multimedia by right-clicking on the link. If you have a web-page already open in front of you, you can enable or disable the Text-Only Mode for it by simply clicking on the icon that says “Text-Only Mode” placed next to the OmniBar. One of the simplest extensions available for Mozilla Firefox, Textise functions just like any other text only browsers or add-ons. You can view any website on page by page basis by pressing the button that activates the text only mode for you instantly. It thereby gives you the ease to enable or disable according to your requirement. You can first load the website you want to visit and then activate the text only version by clicking on the icon located on the Firefox toolbar. The website then displays a page with only text on white texture. What’s distinct here is that the hyperlinks can be opened with a click though the text has left orientation. Fangs Screen Reader Emulator which is another Firefox extension that facilitates you with text only browsing. It is stepped higher than other text based add-ons offered by Firefox and offers features that are bit advanced than the usual add-ons. If you have seen a screen reader, Fangs offer the same view of a webpage in its text only version. This feature helps developers identify any accessibility concerns in web pages and also assists managers to find out a user’s experience with their website. Therefore, considering that most of the commonly used tools are too highly-priced, this add-on is a boon to developers to find website accessibility. As a regular user, you simply need to know that when you open a website, right click anywhere on the page and click on the option that says “view fangs”, it opens up a fresh Firefox window that displays only text of the website. This helps you to view website in big sized text or you can even choose to see it in divided parts. To be able to switch between the text only mode and the graphical mode, you can select “preferences” option from the drop down menu. There are two additional tabs when you open a website in Fang mode, one of which shows all the headings and the other one lets you view the list of links. One of the other Firefox add-ons is ImageBlock and as the name suggests when you load a website it blocks all the images in order for you to browse faster. So, you will be able to see only the text, design and different other elements on the website except for the images. It’s dedicated button the Firefox makes it easier for you to toggle between the GUI and the text only version with no image loading. This fantastic tool converts your Firefox browser in text only mode in no time. It is especially useful for those who use handheld gadgets like, tablets or smartphones or with slower internet connections such as, GPRS, Edge, GSM, etc. Browsing speed is faster and definitely less distracting due to the fact that it eliminates any ad pop-ups, vibrant colors or images. You can simply focus on reading by using the various shortcuts available for navigation. Make use of the Emacs Lisp to quickly search for any information on the web required for something that you might be working on. For example, you can look for information in the PHP mode to be able to dig out information from the PHP manual. Additionally, you can also find dictionary definitions or bug report information with least typing. You can even customize your Emacs pretty fast and conveniently and create your own shortcuts and different functions. Last but not the least; it surely doesn’t consume that much of memory as the GUI. While you can open URLs using the Browse-url in your favorite browser, you can also browse the web in Firefox or use Emacs to browse within the text based browser itself. You can use w3m.el (external W3M browser’s interface) or w3 (web browser written completely in Emacs Lisp to browse within Emacs. Line Mode Browser is the first portable browser to work with different operating systems and the second web browser ever developed. It was ideally the first readily usable browser, or what we call now the World Wide Web. It was next to the first web browser named WorldWideWeb. It’s different that the WordWideWeb was only compatible with NeXT operating system. This limitation of the WorldWideWeb which was not accessible with all operating systems called for the Line Mode Browser. It was the first multi-platform browser that could be installed on several different types of computers. It was an extremely simple tool with an elementary interface. Line Mode Browser has evolved over the years and now you can find information on this text based browser by seeking help from the references or by using keywords. Another cross platform and open source text only browser is Links that comes with a highly simple interface. The interface is again quite similar to a command line tool and also comes with a pull-down menu system. Compared to other text based browsers, Links offers complicated pages, supports both color and monochrome screens, lets you scroll horizontally and supports HTML 4.0 version only partially. This text based browser is specially targeted for those who wish to keep some of the distinct features of GUIs like, the menu, pop ups and more in the text only browser. Same as some of the other top text based browsers, you need to press the “G” key to open the web browser and input the name of the website. Once the browser opens you will notice that the text in it loads in white font which is in the primary website’s pattern. The navigation keys also resemble the ones that feature in the Elinks, therefore, use the arrow keys as normal to navigate through the browser or go the hyperlink and history. It offers more by allowing you to adjust the color of the link and modify the font color. You can refer to the Documentation Webpage for the user manual and get help for the text only browser.